Towanda is an immediate eye-catcher, with a deeply bright, burnt orange and grass green exterior. Its design shows off influences from several cultures, like a multi-leveled roof that is familiar to the roofs of Asia, or the Moroccan decor sprinkled throughout the villa. It actually consists two pavilions, with the kitchen and lounging room/dining room in one, and all three bedrooms (with private balconies) in the other. Space for everyone is no issue. Get into the Caribbean mindset by the pool as you look out to the ocean, or lounge around on the deck or on any of the terraces-even take a nap on the hammock! Towanda features two outdoor showers for a quick rinse after a day that the beach or for a beautiful nighttime bath if you want. For time by the water, it’s only a short drive to Long Bay Beach and Smuggler’s Cove, or drive and explore what else Tortola has to offer! 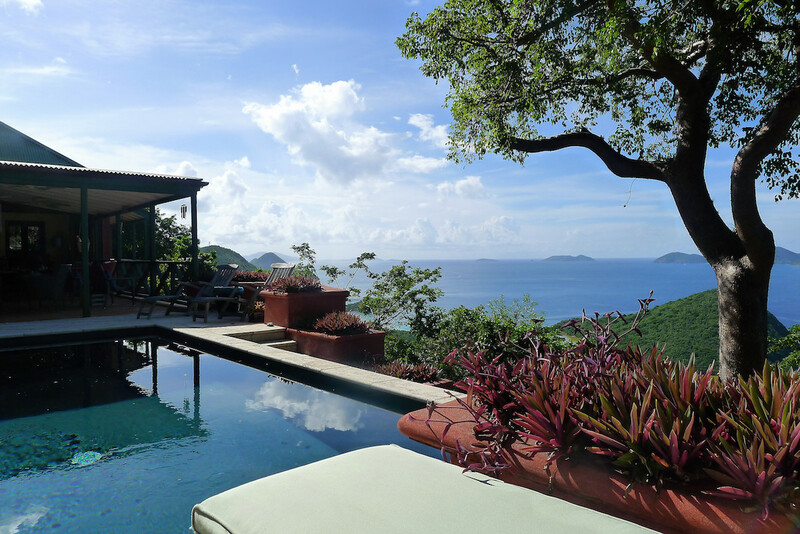 Towanda is a newly completed, artistic home that boasts spectacular long-distance views of Tortola’s leeward side. Sit out on the decks and balconies to revel in the soothing trade wind breezes. A grand Asian-style entry gate ushers you into Towanda’s magical realm and a short garden walkway leads into the villa’s main pavilion. This pavilion houses shady indoor and outdoor living and dining areas, the kitchen and the powder room. Beautifully crafted Balinese mahogany doors and louvered shutters open this pavilion to refreshing breezes and add rich warmth while framing the lofty ocean views beyond. Between the two pavilions is the pool and sun deck with a shaded area for the hammock. Three bedroom/bath suites are situated on two levels of the second pavilion, providing excellent privacy for everyone; all rooms open to covered balconies that look out to the expansive sea views. The beds are draped with romantic netting, and each bath features double vanities and semi-alfresco showers with views. On the upper level, an exotic waterfall cascades from natural stonework for a great outdoor shower. Towanda offers wonderful eclectic furnishings that consist of a charming mix of Asian, African, and Moroccan styles, each nicely accented by antiques, primitive art, and other interesting decor from world travels. All rooms are trimmed with exotic woods throughout. This totally private and well-executed villa is close to heaven! Additional amenities:The kitchen has a 6-burner professional gas range, the pool has a sitting ledge along one side and is chlorine-free, and guests receive a laundry room. Clarification for Towanda’s bedding: There are 2 queen beds in the two bedroom/bath suites upstairs, + 2 smaller twins (OR 1 king, your choice) in the main level bedroom–please note that these 2 twins were purchased in Europe and are slightly shorter and narrower than U.S. twins. As is true in any popular and growing destination, construction of new homes continues in the Belmont neighborhood and near Towanda. We will be happy to get current details of such activity for you, and to give you as much information as we are able to gather or observe about any noise or disturbance nearby. Please inquire! You will be taken from the airport to your villa upon arrival. Departure transfers not included.